Finally! 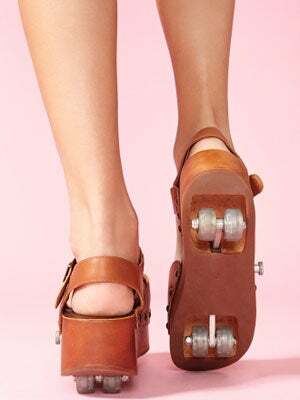 We always wanted to be the coolest girl in ninth grade (despite having actually attended high school anywhere from five to 35 years ago), and now that dream has finally come true — thank you, Jeffrey Campbell, for understanding that true love lasts a lifetime, especially when it begins at the roller rink. Two inches of platform, a retractable wheel, and whole lotta lovin' goodness: These are the shoes we (or at least, some of us) always dreamed of. Before you rush over and drop a cool $165 on these Rollin' Platforms at Nasty Gal, you should know you'll need to change your name to something like Barbie, Karyn, or Foxy Cleopatra. You will be required by law to wear high-wasted polyester short shorts at all times. Any breach of this code will result in formal shunning from the popular table. And, you must absolutely, unfailingly listen to "A Roller Skating Jam Named Saturdays" at least two (2) times per day. Ready, set, roll — these babies are already sold out in all but three sizes. So, unless you want to be the four-eyes nerd crying at the front door of the rink while you wait for your mom to pick you up, better start emptying your piggy bank, stat.